"I woke up at three in the morning, couldn't get back to sleep, and sat brooding with my legs hanging over the the end boards of the wagon, smoking my pipe. I could see the outline of the Granites and stars flickered beside Split Rock. The desert to the west was vast and black, with just a few far-off lights shining weakly from the ranches. My dread hour lasted until dawn and my flagellant impulses carried me in every direction - Nick was losing confidence in me, Beck would run off, we would deplete our water tomorrow before we reached a ranch or creek." 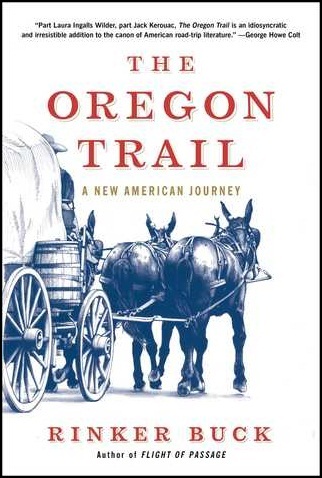 There are several books titled "The Oregon Trail" - this is the one subtitled "A New American Journey." But I think there's little doubt that this is - and will remain - the most popular book about the Trail for some time. When I was in the The States last summer I saw it everywhere, from Seattle clear on down to Utah. In this version of "The Oregon Trail," two guys from back East engage in a covered wagon trip over what remains of the Trail in 2011. Their journey begins in Missouri, and ends both several months and several thousand miles away in eastern Oregon. Along the way they encounter hardship and privation, and the author also muses upon several facets of western U.S. history. I'll go ahead right now and say that I loved it. If you grew up in "the West" like I did, if you identify with that region and have learned to love its history you will, too. It's a long, sprawling trip across several states and back through time, and I'm only sorry that both the book and the expedition it details weren't longer. Which isn't to say that this book is perfect. My complaints, however, are small. For one thing, this book could have used more maps. Given that the wagon passes through some REMOTE areas, it's often difficult to tell where they are using conventional maps. It could have also used less reflections on the author's relationship with his father. I realize that the publisher was pushing this angle, but the relationship between the author and his brother would have been a more fitting centerpiece of the book, and could have been accomplished without removing the narrative to "back East" quite as often. Towards the end of this book the fatherly digressions seem somewhat manipulative, and I began to wish the author would just get back to the Trail, and to his story. An additional complaint - which isn't really about the book itself but rather the route they followed - is why stop in Baker City, Oregon? Most of the pioneers would have pressed on to the other side of the Cascades, if not Oregon City or Astoria. Yes, Baker City marked their arrival in the former Oregon Territory, but none of the pioneers searching for new pasturage would have stopped in that area for long. "Oregon or Bust" meant more than just stepping over an imaginary line. It meant establishing oneself in the fertile lands nearer the Pacific. But again, these are small complaints. On the whole, The Oregon Trail is an excellent book, and I highly recommend it.